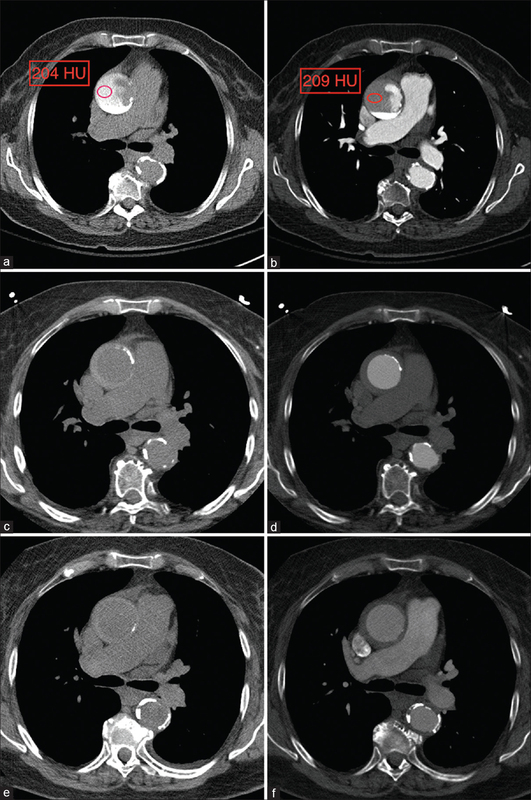 Iatrogenic acute dissection of ascending aorta following coronary angiography and percutaneous intervention is a rare complication. Most reports involve localized aortic dissections as a complication of cannulation of a coronary artery with propagation into the ascending aorta. It is usually treated by sealing the intima with a stent in the ostium of the coronary artery or conservative management, while extensive dissections may require a surgical intervention. We describe a case of the subclavian dissection extending into the ascending aorta that occurred during diagnostic catheterization using the radial approach. The patient was successfully treated utilizing conservative management. Radial artery access for coronary angiography and interventions is associated with lower vascular complication rates when compared to the femoral artery access. Most common conditions that can limit its use are anatomical variants, severe radial or brachial loops, and severe proximal tortuosity. Uncommonly, major complications can be associated with this access. We present a patient who had a large ascending aorta dissection during a diagnostic right radial artery coronary angiography and its management. A 77-year-old female with diabetes mellitus, hypertension, and severe COPD was referred for a cardiac catheterization to evaluate for ischemia after being treated for new onset of heart failure with decreased ejection fraction (EF). The transthoracic echocardiogram (TTE) showed dilated and hypertrophied left ventricle with severely reduced systolic function (EF: 25%–30%). Access was obtained through a right radial artery. An initial 360° loop in the radial artery was negotiated with a 0.014 “High-Torque Floppy wire (Abbott Vascular, Santa Clara, CA), and the catheter was advanced to the subclavian artery where a second 360° loop was encountered. Several attempts with a 0.035” standard J wire followed by a Wholey wire (Covidien/Medtronic Minneapolis, MN) were unsuccessful to negotiate the loop. The decision was made to change to an angled Glidewire (Terumo Somerset, NJ). This wire traversed the loop with some difficulty and was advanced to the ascending aorta followed by a Jackie 5 Fr catheter. After some catheter manipulation and difficulties to engage the ostium of the coronary arteries, a nonselective contrast injection was performed with the intention to localize the ostium of the left coronary. A very large ascending aorta dissection flap was noted [Video 1]. Cardiothoracic surgery was immediately consulted. A stat TTE showed an intimal flap visualized in the noncoronary cusp consistent with an aortic dissection (Type A) with trivial-to-mild aortic regurgitation and no pericardial effusion. The patient was asymptomatic at this point. To provide a complete evaluation of the coronary anatomy for possible surgical treatment, femoral access was obtained and angiography was completed showing a left-dominant system with severe left anterior descending and left circumflex coronary arteries calcified stenosis. The right coronary artery was not feasible to cannulate due to the large dissection flap. Cardiothoracic surgery ordered a contrast chest CT to determine anatomical characteristics and to define an extension of the dissection for possible transcatheter aortic valve replacement approach. Computerized tomographic angiography (CTA) of the aorta showed a large Type A aortic dissection with no propagation beyond the innominate artery, with the false lumen measuring 3.4 cm and the true lumen measuring 1 cm [Figure 1]a. A more detailed reevaluation of the CTA was performed with direct interaction between cardiology and radiology. It was noticed that the entry site of the dissection flap was localized in the innominate artery [Figure 1]b. In addition, by further interrogation, it was noticed that the CTA precontrast and postcontrast had very similar Hounsfield unit (HU), suggesting the possibility of low flow at this time into the lumen of an aneurysm [Figure 2]a and [Figure 2]b. The patient was transferred to the Intensive Care Unit with IV labetalol drip to maintain systolic blood pressure goals of <120 mmHg. Due to the very high surgical risk, the decision was made to continue medical management overnight and to perform possible endovascular repair the next morning. The patient was asymptomatic overnight. 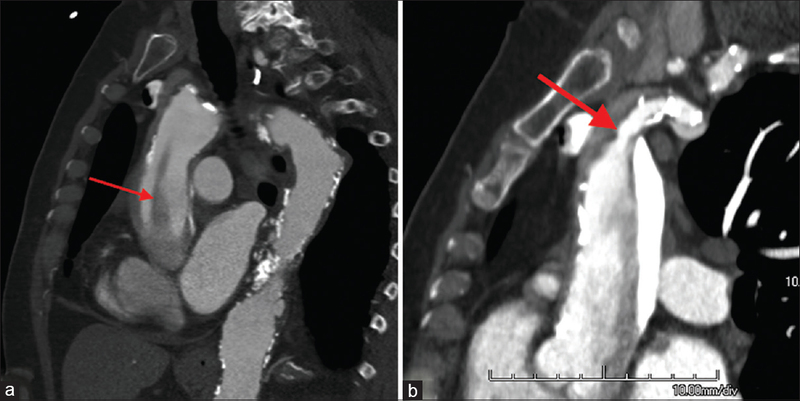 Before proceeding to the surgery, the patient was re-assessed with a follow-up contrast CT. The study showed a significant interval improvement with the complete sealing of the aortic dissection with a small residual hyperdense intramural hematoma measuring 0.8 cm in thickness with no evidence of residual dissection [Figure 2]c and [Figure 2]d.
Medical management was then considered the best treatment. On day 4, the patient was stable and asymptomatic. A control CTA showed similar results with the complete sealing of the false lumen [Figure 2]e and [Figure 2]f. The patient was discharged home and brought back 2 weeks later to complete revascularization of the coronary arteries. Iatrogenic aortic dissections are rare but serious complications during cardiac catheterization. It has been reported that overall incidence of iatrogenic aortic dissection is 0.02%, generally higher in the setting of acute myocardial infarction (0.19%) than in elective setting (0.01%). It occurs more frequently during percutaneous coronary intervention (overall 0.03%) than during diagnostic procedures (<0.01%). In most cases, the dissection is related to the procedure performed with the right coronary artery (RCA) more often involved. The reason that RCA is usually involved is due to the lower amount of the smooth muscle cells and a looser matrix of Type 1 collagen fiber than the left coronary. Most reports of iatrogenic aortic dissection during coronary procedures result from mechanical trauma of the ostium of the coronary artery due to the catheter, inflated balloon, guidewire, guide catheter, or other devices. Aggressive wire or guiding catheter manipulation in the heavily calcified vessels are more prone to dissection. The management of catheter-induced iatrogenic aortic dissection depends on the location of the ostium, extent of the aortic involvement, and hemodynamic stability of the patients. Dunning et al. have classified aortocoronary dissection into three categories on the basis of the aortic involvement: Class I, involves only the coronary cusp; Class II, dissection extends up to 40 mm in the aortic wall; and Class III extends over 40 mm. In our case, the dissection was most probably due to the aggressive manipulation of the hydrophilic guide wire in the subclavian loop. The wire dissected the distal innominate and propagated into the aortic wall. The inadvertent subintimal passage of a guidewire followed by the angiographic catheters probably open the subintimal space of the vessel. It is possible that the hand injection of contrast medium to locate the ostium of the coronary might have provided a further enlargement of the false lumen. To the best of our knowledge, this is the first case reporting a large ascending aortic dissection in the setting of radial access coronary catheterization which was treated conservatively. Noguchi et al. reported one case of brachiocephalic dissection extending into the aorta, but the patient was treated surgically (cardiopulmonary bypass) because of clinical instability. In our patient, the entry point of the false lumen was most likely at the level of the distal innominate artery which extends to the aorta. The patient was hemodynamically stable and asymptomatic, suggesting the flap did not extend or enlarge the false lumen. The very similar HU in the sac of the aneurysm by the CTA immediately after the procedure also suggested no significant flow. These findings are likely explained by the retrograde nature of the flap with compression by the true lumen of the aorta and brachiocephalic artery of the false lumen and spontaneous closure of entry site and the false lumen. Even though not performed in this case, innominate stenting with the intention to close the entry site was considered and could also be a treatment alternative. Our case illustrates the importance of careful evaluation of all images and not to solely rely on the standardized report. The discussion of the CTA with the radiologist and the cardiologist clearly made a major difference in the treatment of this patient, emphasizing the importance of involvement of the entire team including cardiothoracic surgery, interventional cardiology, and radiology. The conservative approach in this patient avoided the potential morbidity and mortality of a very high-risk surgical intervention or complex endovascular approach. Deora S, Shah S, Patel T. Balloon-assisted tracking of guide catheter dealing with radial artery perforation and subclavian loop during percutaneous coronary intervention by transradial approach. Int J Cardiol 2013;167:e161-2. Dunning DW, Kahn JK, Hawkins ET, O'Neill WW. Iatrogenic coronary artery dissections extending into and involving the aortic root. Catheter Cardiovasc Interv 2000;51:387-93. Park IW, Min PK, Cho DK, Byun KH. Successful endovascular treatment of iatrogenic coronary artery dissection extending into the entire ascending aorta. Can J Cardiol 2008;24:857-9. Doyle B, Juergens CP. Conservative management of ascending aortic dissection caused by percutaneous coronary intervention. J Invasive Cardiol 2004;16:92-4. Boyle AJ, Chan M, Dib J, Resar J. Catheter-induced coronary artery dissection: Risk factors, prevention and management. J Invasive Cardiol 2006;18:500-3. Noguchi K, Hori D, Nomura Y, Tanaka H. Iatrogenic acute aortic dissection during percutaneous coronary intervention for acute myocardial infarction. Ann Vasc Dis 2012;5:78-81.